Graduate Keith Parsons of Greenville receives his diploma from Upper Valley Career Center Adult Division Director Scott Naill. 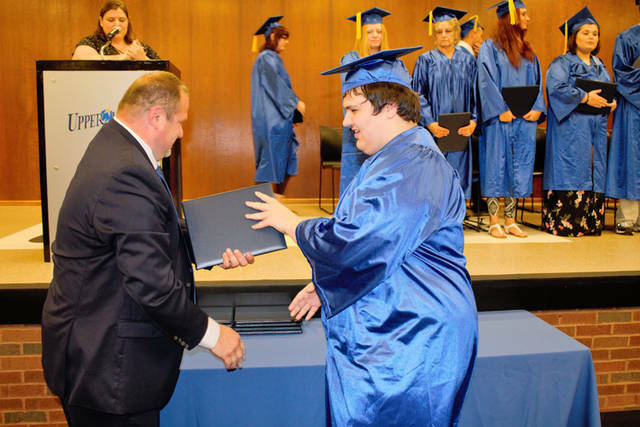 PIQUA – Fifteen students from the Upper Valley Career Center Aspire program turned the dream of graduating into a reality on June 21. The event was attended by Upper Valley Career Center and Aspire staff members, family, friends and guest speakers, Greg Bueno, Integral Manufacturing, and Rev. Lauren Allen, First United Church of Christ. Upper Valley Career Center Superintendent Dr. Nancy Luce welcomed those in attendance and commended the graduates on achieving this milestone accomplishment. Bueno, congratulated the graduates on their success and offered words of inspiration. “Remember the challenge you overcame to get to where you are today. Never limit your challenges but challenge your limits. When you hit a wall in life, dig in deep to find your second wind,” Bueno said. Allen encouraged the graduates to continue learning. Luce and Upper Valley Career Center Adult Division Director Scott Naill awarded the diplomas. The 2018 Aspire graduates are: Conover- Shelby Davis; Greenville- Sharon Allen and Keith Parsons; Houston- Shelia Heck; Piqua- Jayme Burks, April Finley, Shannon Valentine; Sidney- Kyle Crull, Kayli Morris, and Nicci Morrison; Tipp City- Christina Henn; Troy- Thomas Davidhizor, Tristan Meek, and Kimberly VanWinkle; West Milton- Angie Pritchard. Upper Valley Career Center operates Aspire classes in sites across Miami, Shelby and Darke counties as well as online. Participants may prepare for their General Equivalency Diploma, refresh skills needed for employment/advancement or prepare for post secondary transitions. Individuals lacking a high school diploma or looking to refresh academic skills are encouraged to contact the Upper Valley Career Center Aspire program at 937-778-1078 or email Sarah Thomason at thomasons@uppervalleycc.org to enroll. Classes are offered in Piqua, Troy, Sidney and Greenville.